Fred Upton has another primary. This time it is Jim Bussler, a nurse out of Dowagiac. Upton has had tough primaries over some votes in the past, but has survived them, even when others like Joe Schwarz did not. The dems are running Paul Clements, a sacrificial lamb candidate. 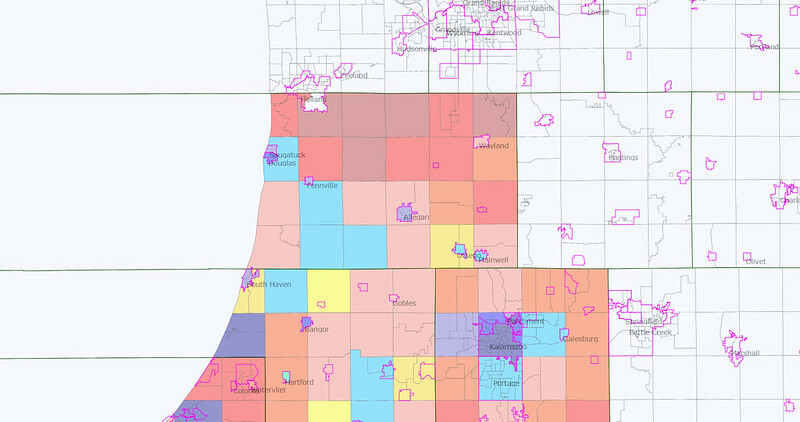 However, nothing is 100% here with Kalamazoo and Benton Harbor. The 2011 Update is here. The 2009 Update is here. This district is – on paper – a swing district. It has some strong GOP and strong democrat areas and is usually close in presidential elections. On paper is what’s key. Despite being competitive in presidential races, the only base that elects state reps is in the City of Kalamazoo. They have no democrat state senate districts (although contend for one all elections) and only have one state rep. That’s not to say that we don’t need to keep an eye on things here. Fred Upton’s a moderate republican whose toughest election was 2012. It was his first general election win with less than 55% of the vote. He did better in even 2006 and 2008, overall horrific years. Conservatives never were enamored with him. Liberals aren’t crossing over for him as they used to. He’s biggest strength is in his home area of St Joe in Berrien County. For the map, I’ll use the same color code, staying with the Dark Blue for 70% d areas that I used in District 5. I did three maps here because this district is so close in 2012. 04 was the high side recently, and 2012 is the low side. The maps are in order of most recent election of the three. I don’t have exact Holland borders here because of the city re-precincting names between 08-12. I may be slightly off with Berrien County townships as well. The last two maps cut off the top part of Allegan County. It’s mostly 70%+ across the board every election. Starting at the top with Allegan County. Allegan County has part Holland influence, part Grand Rapids influence, and part Kalamazoo influence. Allegan County is a GOP Stronghold at 59%, but looking at the microlevel, you’ll see that the dems are not without strength here. The GOP is strong because that Northern tier is absolutely blood red. Overisel Twp is the 2nd most GOP township in the state in 2012 (at times it is first). That’s as much a part of the Dutch area as Ottawa County is. The southern tier is competitive, although Bush almost swept it in 2004. Bush did extremely well in the competitive areas. Of the areas Romney lost, Bush won Allegan, Cheshire Twp, Clyde Twp, Fennville, Otsego, Otsego Twp, Plainwell, and the portion of South Haven. He lost Lee Twp, Saugatuck, and Saugatuck Twp. Douglas wasn’t incorporated as a city then and part of Saugatuck Twp, so he probably lost that too. The dems have Saugatuck/Douglas which is the gay capital of West Michigan (or so I’ve heard.) Fennville has a large Mexican population as does Clyde and Lee Townships. I’m not 100% sure, but I think Plainwell and Otsego have union presence. It’s also close to Kalamazoo. South Haven is dem, but it’s not as bad as it looks. Obama got 70% in the Allegan part, but that’s due to winning 5-2. (It’s usually 50-55% dem citywide) Still, we’re bleeding here. Bush got 62.52% here in the district part of Allegan (almost all of it). McCain dropped to 54.08%. Romney got 59.22 in a recovery, but there’s still a lot more blue here than 2004. The dems are making inroads. Are we in danger of losing this county? No way – not with the northern part of the county. Will that southern tier factor in a congressional race? That’s a possibility, when you have Kalamazoo and Benton Harbor in the district. Kalamazoo County is the biggest part of the district. It’s also trending to the left. It was close to 50/50 in 2000. It was 51/47 in 2004. 59/39 in 08. Romney controlled some of the bleeding and it’s now 56/43. Downticket, it’s not AS bad, but still a cause of concern. I don’t know this county as well as blogger Conservative First from the Western Right blog. He can correct any errors I have here. Bush lost only four municipalities in 2004. Romney lost seven. (McCain 9). The four Bush lost are Kalamazoo, Kalamazoo Twp, Oshtemo Twp, and Galesburg. 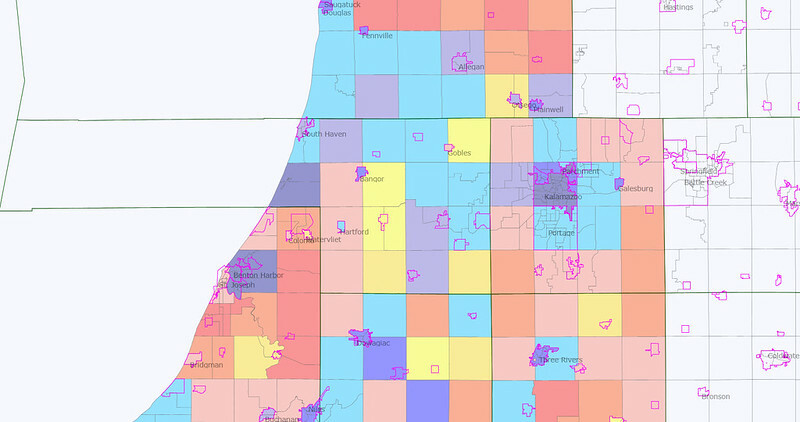 Kalamazoo City is a dem stronghold. You have WMU in the western part of the city, and a high black population in the north end. Kalamazoo Twp has some of those same areas to a lesser extent. The problem today is that Bush’s 32% (-10,000 vote spread) and 41% (-1760) are now Romney’s 24.50% (-14662) and 33%. (-3477). Oshtemo and Comstock townships are to the West and East. Oshtemo Twp is WMU country. It’s gone from close to 50/50 to 57% dem. 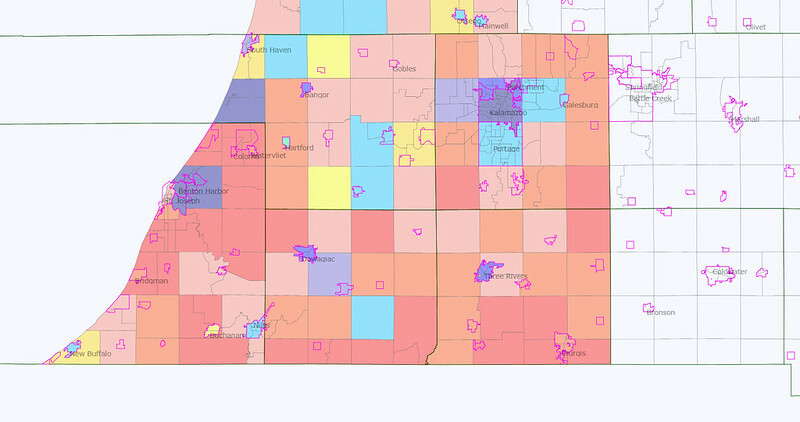 Galesburg is blue, but not by a giant margin. It’s those three municipalities Romney lost that Bush didn’t that scare me. Portage, Comstock Twp, and Parchment. Those are three suburbs that border Kalamazoo. I don’t know those suburbs in depth except that Portage is the 2nd largest city in the county. It’s always been close, but Bush won it twice. Parchment is rapidly going blue. Romney did worse than McCain there. I don’t know much about Comstock outside of Bell’s beer. It’s still close. Those three areas are the key to reducing losses in the county. We have to do so here. St Joseph County (City is in Berrien County) to the Southeast I know very little about and I drove through it once. It’s old free soil country. The only area that went for Obama was Three Rivers. Bush did very well in the rural parts of SW and South Central Michigan along the I-94 corridor and I-69 N/S Corridor – much better than both Romney and McCain. Romney won it with 55.55%, but Bush broke 60% here. McCain cratered and barely won it. Three Rivers is reliably dem. Romney and Bush both won the rest of the area, although Bush to a much larger degree. Cass County to the West I know very little about. I drove through it once. It’s old free soil country, and it was a major stop on the Underground Railroad. It has a sizable black population for a rural county (Dowagiac, Cassopolis and Vandalia) that goes back 150 years, although the population is much lower than Berrien County. It’s also prone to wild election swings. Bush and Romney got 57 and 56% with a similar number of votes. Bush struggled here more in 2000. McCain cratered here with 46.89%. McCain didn’t break 57% in any municipality. Romney broke 60%+ in 6 of them, Bush in 5 of them. McCain lost 8 municipalities, Romney lost three and Bush lost two. 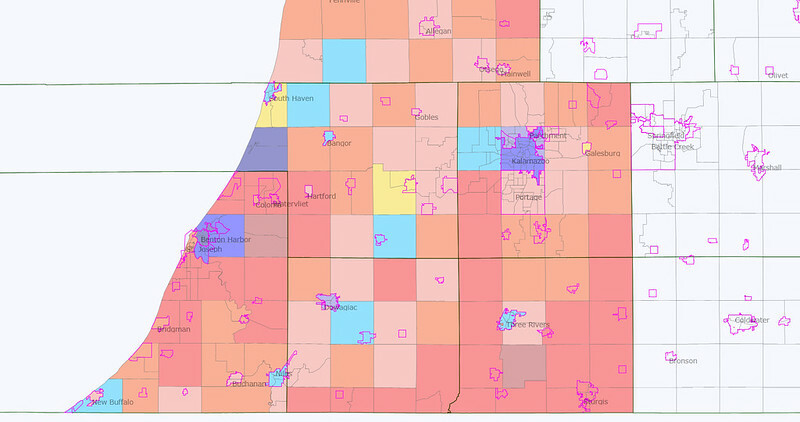 LaGrange Twp and Dowagiac are the constant dem areas. Calvin Twp went for Obama twice, but Bush won it in 2004. In a district like the 6th, this is a key area for the R’s. Van Buren County is erratic, but has had a bit of a blue taint lately. There’s a sizable Chicago influence here, and no Benton Harbor to counter-influence. The Mexican population has increased here as well with the farms. Bush won the area narrowly. Romney lost it by 160 votes. Obama won Antwerp Twp twice. Covert twp is heavily minority. South Haven is a former small industrial area now a tourist haven for Chicagoland. Bangor, Decatur Twp, Geneva Twp, Paw Paw Twp, and South Haven City/Twp have gone dem the last three presidential elections, mostly narrowly in Bush’s case, but less so for Romney. It’s been close in elections since 92, and is a key county in this district. Hopefully Obama being gone will flip this district as Chicago homerism is less of a factor. Lastly, Berrien County is the battle of strongholds. It’s the Southwest corner of Michigan, and you are as likely to see Chicago sports teams supported as Detroit teams. New Buffalo is about an hour away from there, and there’s a lot of vacation homes there. Niles is across the border from South Bend, which is the closest major city. There are a couple swing areas that are competitive, like Buchanan and New Buffalo, but most of this district is heavily red or blue. A candidate wins by turning out the base and narrowing the wins in other parts of the district. The three strongholds for the dems here are Benton Harbor, Benton Township, and to a much lesser extent, Niles. Niles sometimes is close. Benton Township/Benton Harbor is majority black and votes accordingly. Obama won the township with about 75%, and the city 97%+ the last two elections. Kerry won the two areas by 5800, Obama in 2008 by 7900 and in 2012 by 6600. Lincoln Township is the big Republican stronghold, along with many of the smaller townships (60%+). They also do well in St Joseph (almost always called St Joe) by a lesser amount. Bush won the county by 8200 votes, McCain lost by 4200, and Romney won by 4700. It leans R, but not safe. This is also a key county in the district if it opens up. Obama being gone may make this more Republican as Chicago homerism wanes. A little more detail on Kalamazoo. Oshtemo has a bunch of student apartments which turn out in presidential years, but not in midterms. Portage is upper middle class, with a lot of professionals at Pfizer and Stryker. It usually votes R, but not always. Comstock is more blue collar and competitive. Rs won a majority of the township board. Parchment is blue collar and swings depending on the election.